Joe Smolinski's artwork is intimate, poignant, and should change the world. That is if artists ran the world. The most important part about artwork that is shown in galleries and museums is the affect it has and the impression it leaves in the mind and the eyes of the viewer. Smolinski's artwork makes its point pretty fast and very effectively. For some time now he has been interested in a frightening near-futuristic possibility. His drawings document an environment where all trees are becoming cell phone towers and are invading the natural landscape. Objects of the most menacing proportions, these trees are icons of human desecration to the world that contemporary civilization has falsely made its own. Trees are sacred and Smolinski revels in their historical, spiritual and personal value. 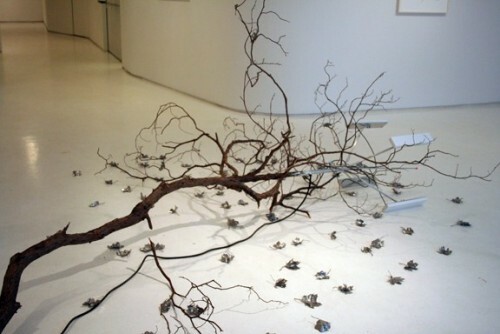 His past work has shown allusions to both ancient and recent occurrences, from the temptation of original sin in the Garden of Eden to WW2, and the boom of the logging industry and recent natural disasters. Trees were once a majestic form, and central to our ancestors contemporary life. However, today it is obvious that contemporary life has little time for trees or the environment altogether. Human interaction is parasitic in his drawings; our need and obsession for more man made resources is marginalizing our admiration of nature's once pertinent beauty. 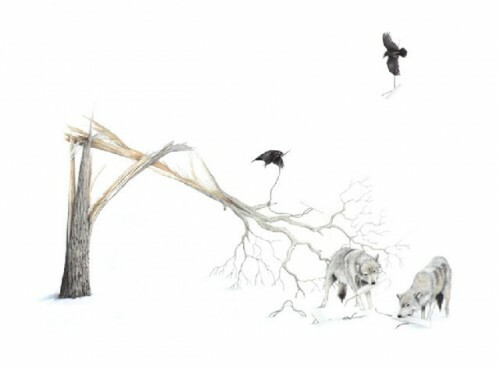 Throughout history animals have gone extinct due to technological advances and in Smolinski's new solo show on display at Mixed Greens, they aren't going to take it anymore. 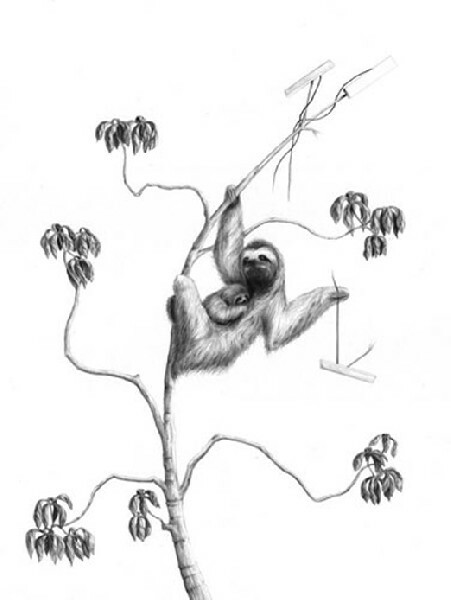 The artist envisions a point where the animals can't take the infringement anymore and slash, and rip apart the parasitic cell tower trees. With societies obsession with quick fixes, our generation has done insurmountable amounts of damage to our natural land and resources. 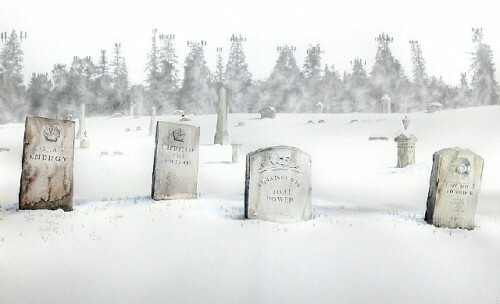 In the mixed media drawing "Cemetery" (2009), there are four gravestones in a snowy cemetery. Very ominous silhouettes of cell phone tower trees loom over the four stones that mark the death of solar power, the electric car, tidal power and the wind turbine. All bold predictions for a hopeless future, and with the way things are going in this day and age it is hard to show optimism towards a change to the status quo. The electric car did live once and was quickly killed (as documented in a 2006 documentary called "Who Killed the Electric Car. "), and the other clean energy sources receive far less attention than coal, oil and nuclear power, all of which are destructive to the environment. Another big piece of the exhibition is Smolinski's reference to Robert Smithson's "Spiral Jetty," which the late environmental artist created in 1970. Smithson's environmental art installation has been facing its greatest struggle for survival most recently. 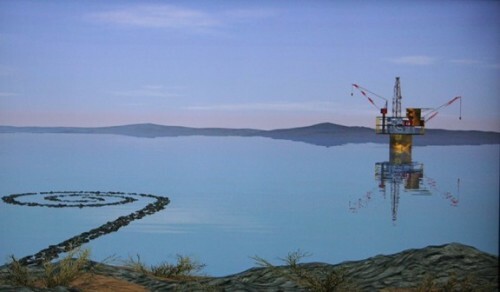 With the increased need for oil reserves in America, organizations have applied for the rights to drill in the Great Salt Lake. While the first application was thankfully denied, the threat of this dogma still remains an ominous possibility in the near future. 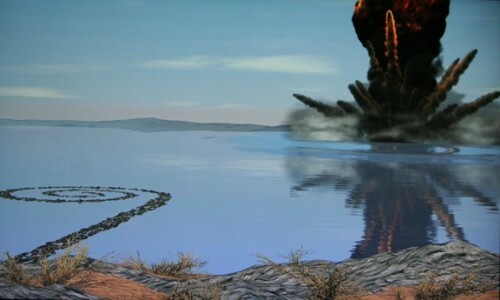 In his installation "Taking Back the Jetty," (2009) a time-lapse video of an oilrig off in the distance behind Smithson's work, is blown to bits. 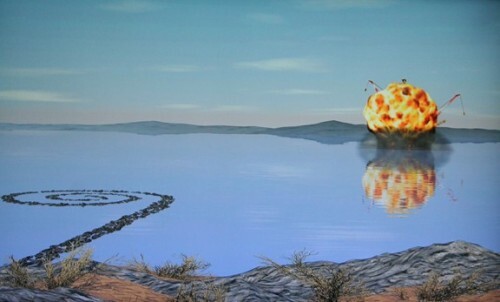 "Shipwreck" (2009) depicts the Jetty prominent and unscathed as an oil tanker is seen split in half and sinking to the depths of the Great Salt Flats. 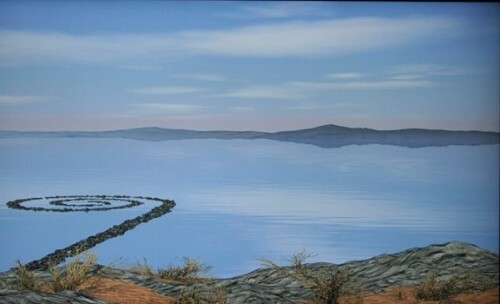 Off to the corner is an installation of a ruined Spiral Jetty that is covered in oil. We get both sides to the possible scenario and obviously the latter is unacceptable. Finally the largest work in the show is an installation of a constructed cell phone tree tower that has been broken and uprooted from the ground. It lies on the gallery floor, antenna still blinking but no reception. This is a wake up call (pun intended) to the world and hopefully we all answer. If nature keeps getting ignored while civilization continues to consume in excess, then Joe Smolinski's nightmarish prophecy will come to fruition.